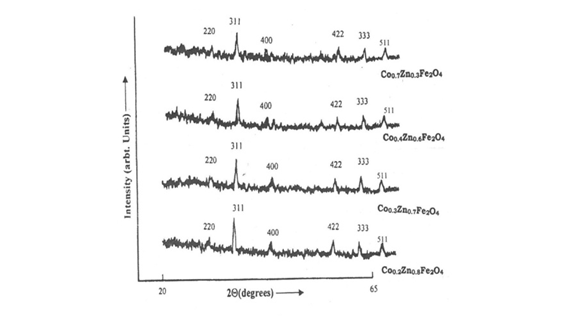 Cobalt and Zinc ferrites CoxZnyFe2O4,(x=0.7,0.3,0.4,0.2 and y=0.3,0.7,0.6,0.8) were prepared by solid state reaction technique. The crystalline structure of the sample was investigated by X-ray diffraction(XRD). All samples show cubic spinel structure. The lattice parameter decreases with increasing cobalt content. Magnetic properties shows that the prepared sample exhibit ferromagnetic behaviour at room temperature. The saturation magnetization increases with increasing cobalt content. Curie temperature of various samples were calculated. The Curie temperature increases with increasing content of Cobalt ions. The variation of initial permeability and magnetic loss with frequency are explained with the help of established models.